The paddocks near my place in Porcupine Ridge are busy with visitors. Almost a hundred Straw-necked Ibis may be seen there each day, first on one paddock then in the other; busy probing the soil with long bills and stalking through the grass tussocks. Straw-necked Ibis are large, heron-like birds with naked heads and a long curved bill. Their necks and bodies are whitish, and their wings look black from afar, but are actually iridescent – with metallic green and gold colouring. As we are nearing breeding season for ibis, their necks are decorated with yellowish, filamentous feathers – hence the name Straw-necked Ibis. Also within the flock of Straw-necked Ibis are about eight Australian White Ibis, a close relative and similar in appearance, but nearly all white in colour, with black tail and black plumes. The White Ibis is also referred to as a ‘bin chicken’ due to its habit of scavenging bins and rubbish dumps, especially in New South Wales. They may be seen tame and scavenging in parts of Melbourne and at Healesville Sanctuary, but the less bold and adaptable Straw-necked Ibis never engages in such behaviour. 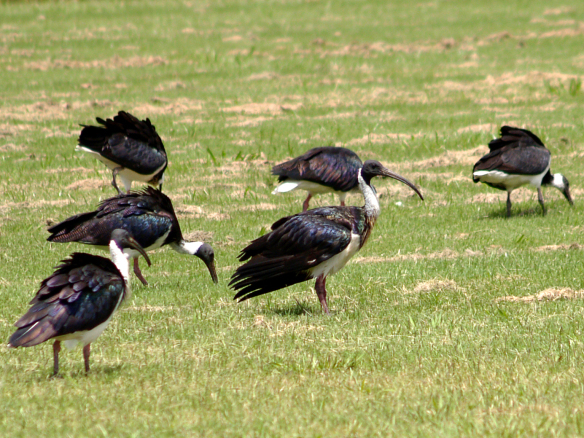 The ibis are here to feast on the frogs, crickets, grasshoppers, beetles and crustaceans, such as land yabbies, that are flourishing in our wet paddocks. One of the old names for the Straw-necked Ibis is the ‘farmer’s friend’ due to their eating of grasshoppers and beetle larvae – a much nicer name than the bin chicken! The ibis will stay on as long as there is plenty of food, roosting in nearby tall trees at night. This habit protects them from predators such as foxes, and also shields them from exposure to cold winds and frosts. Straw-necked Ibis are often seen flying high overhead, in a v-shaped or chevron formation, or in even larger flocks wheeling slowly on the warm air currents. They are great fliers, and often fly hundreds or thousands of kilometres between temperate locations in the south and tropical areas, and between inland sites and the coasts, possibly as regular seasonal movements and sometimes in response to local environmental conditions. The longest recorded movement of a Straw-necked Ibis was from Muchea in south-western WA to Beaudesert in south-eastern Queensland - a distance of well over 3,500 kilometres. Despite the fact that we see them in paddocks, ibis are regarded as water birds, as they need water in the form of large rivers and lakes to breed communally in large colonies. In the past, colonies of 5,000, 20,000 and even 150,000 nests were common in wet years. * These mass breeding events would ensure there were plenty of young ‘farmer’s friends’ to replace their parents' generation. In the past 30 years, there have been very significant declines of all of our waterbirds – spoonbills, egrets, herons, ibis and waterfowl, such as ducks. Scientists from around Australia are studying these groups to try to determine the cause or causes of the declining numbers. In the case of the ibis, it seems that it is the very high mortality rate of young ibis that is the problem. The Straw-necked Ibis had a relatively good year in 2015-2016 with over 150,000 nests in the Murray Darling Basin, and many young fledging. Yet, the flocks such as the one visiting my local paddocks seemed to be exclusively adult birds. A team at CSIRO attached radio transmitters to twenty Straw-necked Ibis in Spring 2016 - ten adults and ten juveniles. Just three months later, only two adult individuals had survived. The birds succumbed to a litany of tragedies – predation of juveniles, death of adults by disease (botulism), starvation, and poisoning from pesticide affecting insects on paddocks. Weather extremes such as very hot days followed by cold windy nights resulted in the deaths of two juveniles, and three birds went missing in these conditions. Surprisingly, collision with cars is a cause of death for many waterbirds, and one of the juveniles was hit by a car. Some ibis are shot, as they get caught in the firing line of duck shooting season. Twenty individuals is not a large sample size, but it is clear that it is a harsh world for both adult and young Straw-necked Ibis. So how can we help the farmer’s friend? We can support environmental water flows in the lake and river systems of the Murray-Darling, as well as support organic farming. I think the story of the aging ibises in our Daylesford paddocks is a bit sad – and a reminder that we are intimately connected to other parts of Australia. *S Marchant and PJ Higgins, Handbook of Australian, New Zealand and Antarctic birds Vol 1 Ratites to ducks, Part B Australian Pelicans to Ducks, Oxford: Oxford University Press, 1990 (p.1089).